After buying, trying, and returning a Buffer Technologies AR magazine coupler, I decided to make my own. Why - you ask would I send back a perfectly good magazine coupler for a DIY coupler? 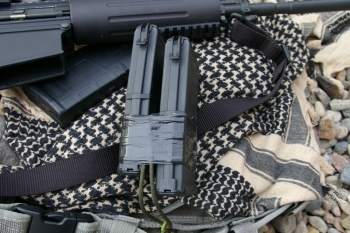 Although the plastic and metal AR magazine coupler looked impressive construction straps and bolts, it did not work with my Magpul 308 mags at all... even though it said it would. 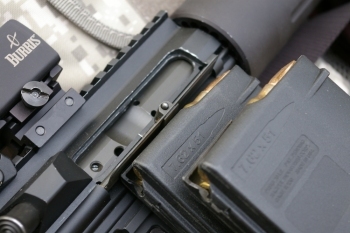 Both 308 and 5.56 magazines could be twisted out easily or would free themselves after a couple rounds of recoil. To be fair it should be used with metal mags and I am a Magpul magazine whore so that product was useless to me. This would be an example of a product I would not recommend. The solution came in the form of a comment from one of the Israeli instructors during my Mako Defense Training. His observation/comment was that he has yet to see a magazine couple which did not eventually fail, but "duct-tape will never fail and it's free." As it turns out the guy who served in a top Israeli special forces with decades of experience in defensive fighting was correct. For over six months my home brew DIY AR magazine coupler has taken a beating and has never come close to failing. I sized a piece of 1/2" high density foam some custom parts came packaged in. Then it was as simple as placing the magazine together and duct-taping them together with about 5-7 layers of duct tape. 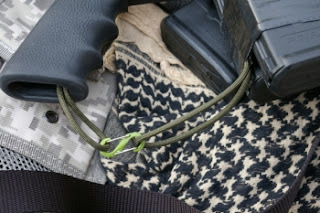 Per the suggestion of some of the instructors at the Mako Defense training, I also secured in a simple para-cord loop for both easier extraction and for securing the dual magazine to the AR. I can get this the rational into why you want to attach a dually to you weapon in another article, however the idea is that it prevents you from dropping/fumbling the mags during clearing maneuvers. 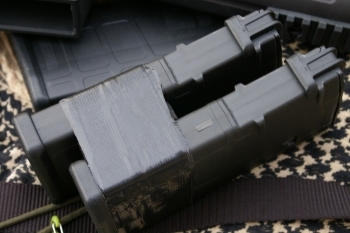 The other thing you want to avoid in setting up dual coupled AR magazines is to assure you appropriately stagger the magazines. Magazine #2 (the right-most magazine) should be low enough that when magazine #1 (the left-most magazine) is fully inserted that magazine #2 will allow the ejection port cover to swing fully open with blocking it's path. Most folks forget this detail until they start having jams at the range. 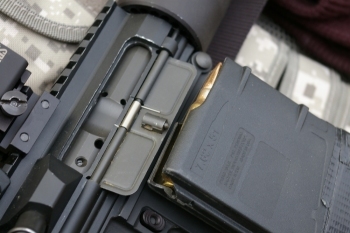 In the photo I show the optimal magazine #2 staggering, however many people do push that mag a little higher which leaves the ejection port cover with a horizontally slanted position. My observation is that the higher the ejection port cover it the higher number of jams you will have related to ejection port cover interference. Below is a picture showing the difference in the heights of the magazine after they have been properly staggered. 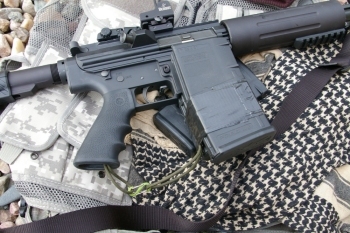 If you are setting up a 5.56/.223 AR with coupled magazine you also have the option to use one 20 round and one 30 round magazine instead of two 30's. This give the base plate a none staggered flat base which may be better for some shooting situations. So far my original/non-knock off duct tape has held up just great. I was thrilled and found some digital camo Duck Tape and put a band around magazine to add a little camo look and allowed me to mark and number the magazine with a sharpie permanent marker. Cool article and do it yourself. I am glad to hear it last well long term. I was worried that it may begun to slip or tear in some fashion with repeated use. Thanks for posting.